Crosby Ravensworth School celebrates success as first in the county under new-style OFSTED inspection. At the end of September, Crosby Ravensworth became the first school in the county to receive a new-style one day 'section 8' OFSTED inspection. The school has now been given permission to make the details public. Particularly singled out for praise were the children's academic perfomances, along with the 'wonderful atmosphere' that provides for 'very well developed' spiritual, moral and social skills. The report goes on to back the school's self assessment that it remains 'good', while safeguarding remains effective. The report, which takes the form of a letter to the headteacher, can be found here. A press release summarising the report can also be found here. Please follow the link below for the most recent Anglican Church inspection. 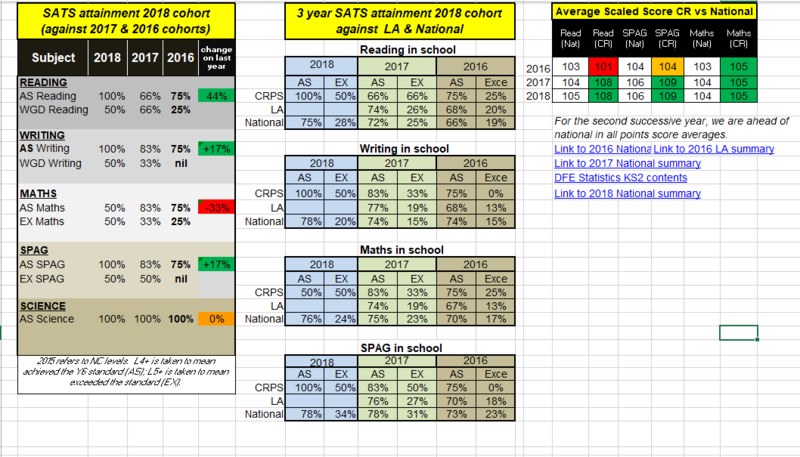 Nationally, 64% of pupils attained the expected standard in reading, writing and maths combined. Crosby Ravensworth beat the national average scaled SATS scores in each subject apart from Maths. Crosby Ravensworth beat the national average for progress in Reading, Writing and Maths with 100% of the cohort making expected or better than expected progress in each subject. Click here to open up a table comparing the 2017 school leavers with the past two years in Crosby Ravensworth. Comparisons are also made with schools from within Cumbria Local Authority and those nationally.